The Elbe estuary in Hamburg is a natural obstacle for modern land-bound traffic. Yet the harbor made Hamburg into a traditional trading city. 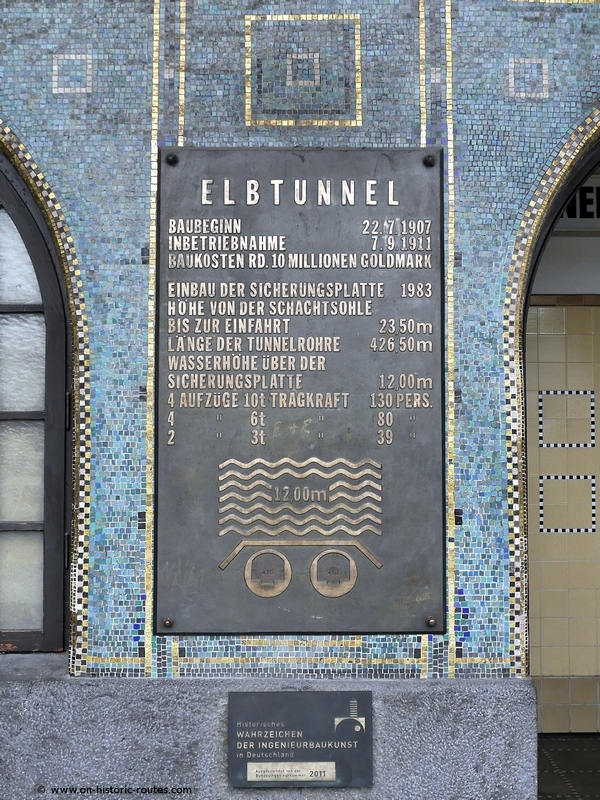 The old Elbe tunnel is part of both, the harbor and the means to cross the river. It is a hidden gem of industrial heritage in the vibrant city. 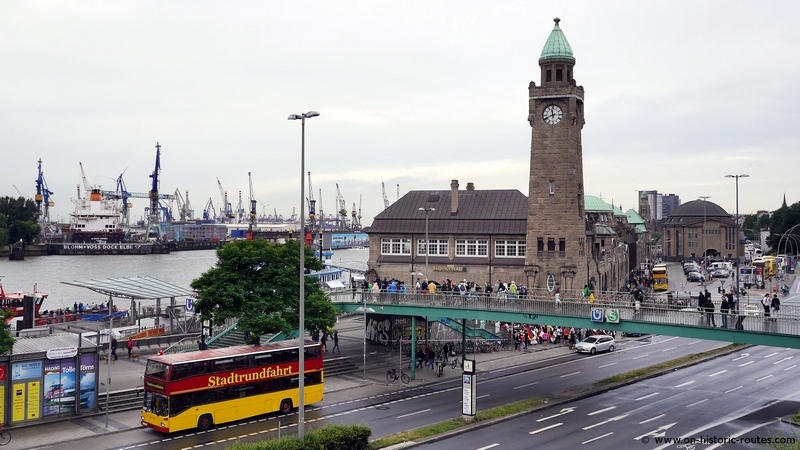 Hamburg’s historic center and the residential areas of the city lie on the north shore of the Elbe river. During the 19th century, the harbor expanded on the south shore with it’s labor intensive industries like ship building and freight handling. A daily commute of thousands of workers across the river started and the flotilla of small ferries was not reliably able to handle it. New solutions were sought. Bridges across the river were not an option since they would block traffic for ocean going ships just as the bridges five kilometers upriver, were the railroad crossed the Elbe. The city decided in favor of a tunnel and in 1907 the construction of the Old Elbe tunnel started. To build a tunnel underneath a river had been done before. British engineers pioneered with the Thames Tunnel in London, which was completed in 1843. It was a pedestrian tunnel, which was converted to a railroad tunnel and still used by trains today. The Severn Tunnel underneath the tidal estuary of the Severn between England and Wales is much longer with seven kilometers and was completed in 1886. It took the engineers in Hamburg four years before the old Elbe tunnel was completed with two tubes running in parallel for more than 400 m under the harbor 24 meter beneath the surface of the river. The entrance to the tunnel tubes. Looking at the design of the tunnel today, it is an interesting mix of being from a different era and yet very modern in some aspects. The tubes below the river are accessed on both ends through a staircase and elevators. While this is fairly common for pedestrians and cyclists, the Old Elbe Tunnel also has elevators for cars and small lorries. Four of these are located on both ends of the tunnel and surprisingly around 300.000 vehicles are still using the tunnel each year. Of course this does not compare with the modern highway tunnel that crosses the Elbe few kilometers downriver. There, more than 100.000 vehicles are counted each day! 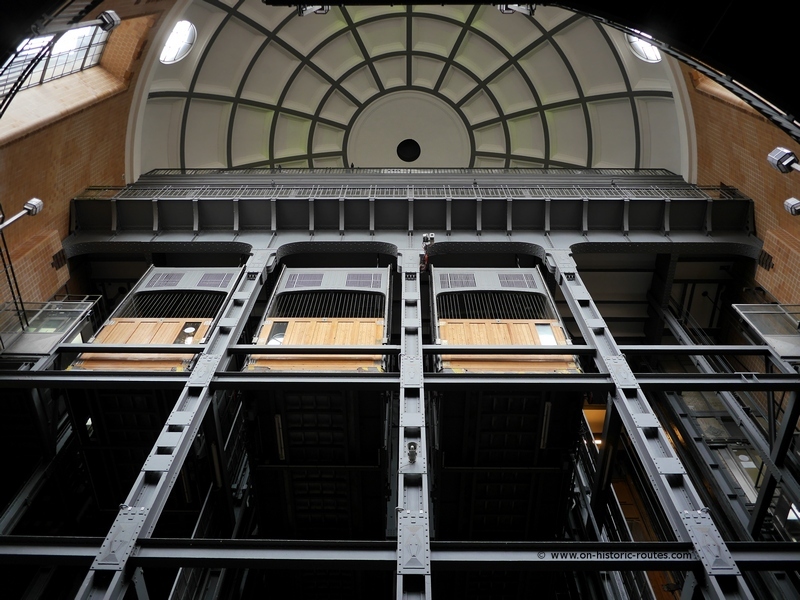 Four elevators for vehicles and two for pedestrians (small cages on the left and right) allow access to the tunnel along with the stairs. 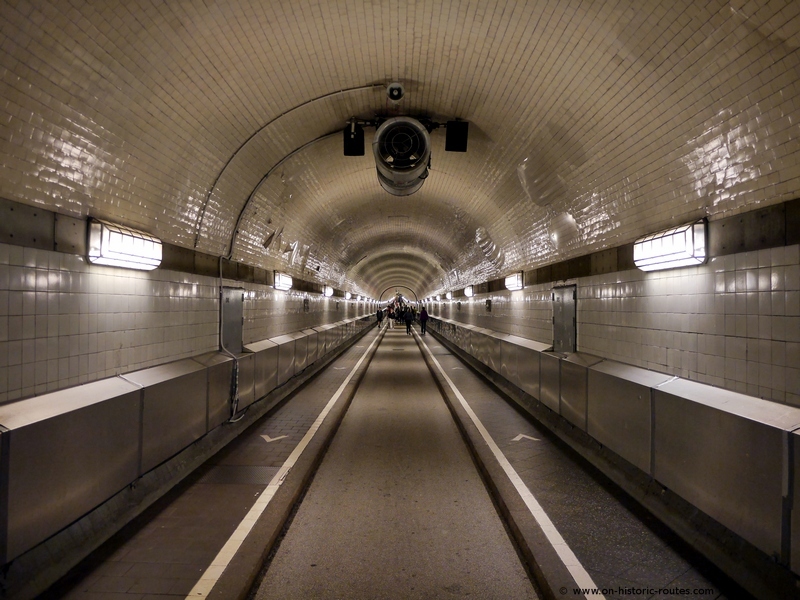 The old tunnel was mainly designed for pedestrians and while we have seen a unprecedented increase in motorized transport since it opened in 1911, pedestrian transport becomes increasingly more important in modern cities. 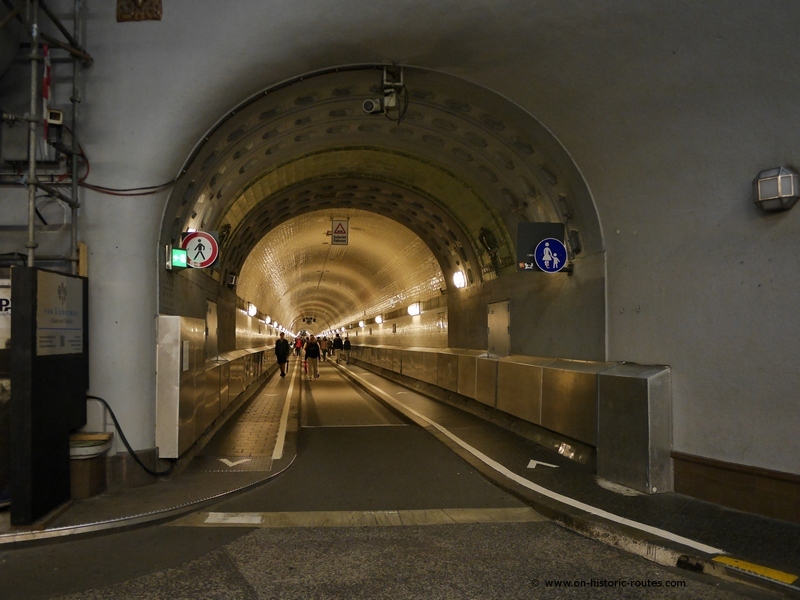 The Old Elbe tunnel is an example how a mix of human powered and motorized traffic can be addressed. Most of us are likely used to the functional style of modern infrastructure. Concrete wall everywhere, often not even covered or painted. 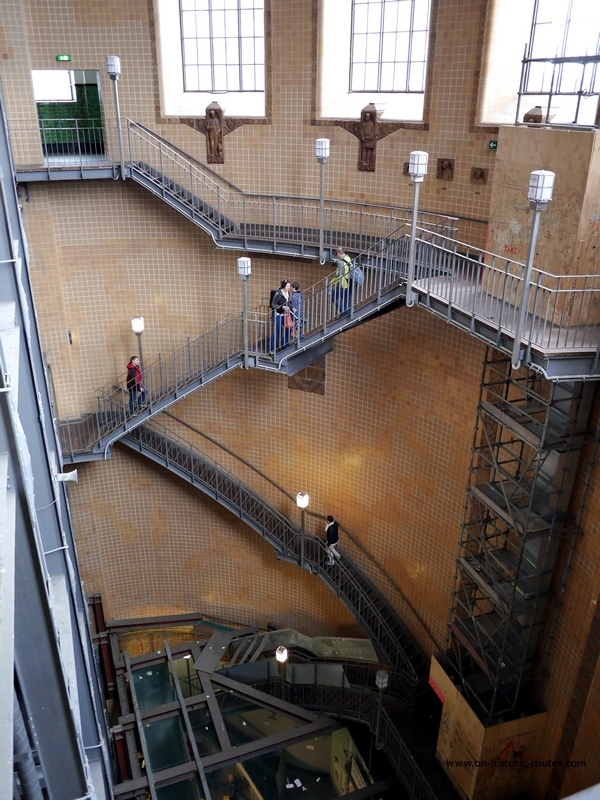 Well, the designers of the Old Elbe tunnel had a different approach. While the entrance buildings on both sides cannot be called grandiose, they have interesting design features. The entrance area has natural lighting through the large windows opposite the elevators. This gives a warm and more natural atmosphere incontrast to the artificial light in the tunnel tubes. Large windows illuminate the entrance building. Colorful tiling is welcoming the visitor at the entrance and the staircase is covered with ornaments that show figures from the city’s history as well as portraits of the engineers, who built the tunnel. Once you have reached the tubes at the bottom of the staircase, individually designed tiles showing life in the river cover the whole length of the tunnel. 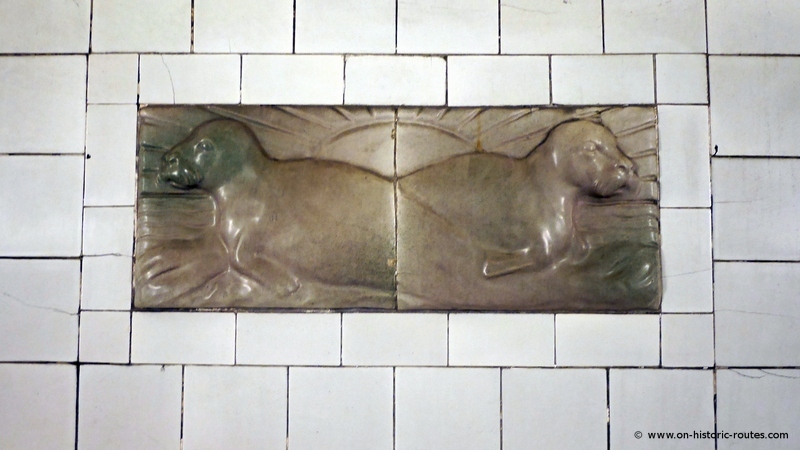 Glazed tiles showing seals in the tunnel tubes. The decorated entrance showing facts about the tunnel. The north entrance to the Old Elbe tunnel is next to the Landungsbrücken, the central riverfront at St. Pauli neighborhood. It is easily reached with public transport (Landungsbrücken station of the S-Bahn). I highly recommend to visit the tunnel. It is open all year round and free to use. The view from the south end towards the city center is very good and exploring this old monument while looking for details like the ornamented tiles is good fun. The entrance near the Landungsbrücken quay (domed building on the right).